Celebrate the lives of those who have won the battle with breast cancer when you wear our Personalized Hope Ribbon Breast Cancer Team Long Sleeve Shirt. With every step you take, you are joining millions of people around the globe help save lives and spread awareness. This Personalized Breast Cancer Shirt is perfect for any walk events and helps the world’s largest movement to end the disease. Our Personalized Breast Cancer Survivor Shirt is available on our premium 100% cotton long sleeve shirt, machine washable in youth sizes S-L and adult sizes S-2XL. Includes FREE Personalization! 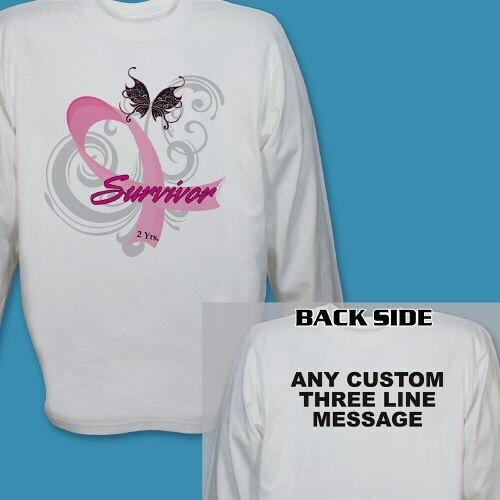 Personalized your Breast Cancer Awareness Long Sleeve Shirt with how many years you are a survivor and any three line custom message on the back. Additional Info By wearing this t-shirt, you will help support breast cancer awareness and also help fund research for a cure. Be sure to also promote the cause with our Personalized Hope Ribbon Breast Cancer Awareness Key Chain and our Personalized Hope Ribbon Breast Cancer Awareness Tote Bag to show your community who you are walking for. For all your Personalized Breast Cancer Gift Ideas, shop MyWalkGear.com.